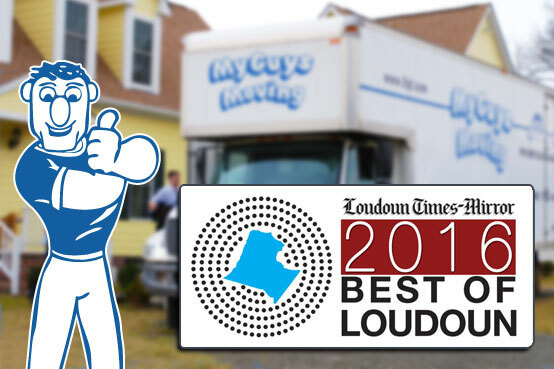 My Guys Moving & Storage was voted Best Moving Company in Loudoun County based on a 2016 poll of nearly 200,000 votes cast by almost 20,000 Loudoun Times-Mirror readers. The number of votes cast for this year’s poll of favorite people, places and businesses in Loudoun County was twice as great as last year’s. It is the third consecutive year that My Guys Moving & Storage has won this prestigious award in the category of best moving service. There are some really great movers in Northern Virginia, so we are proud to have been selected from the best moving companies in Loudoun County, VA, and we would like to take this opportunity to thank all our customers, family and friends for their gracious support. We couldn’t have done it without you! The poll drew from a wide variety of contestants, ranging from farmer’s markets to real estate agents, from art galleries to the most colorful character in Loudoun County, VA. It is a truly comprehensive and interesting list of people, businesses, and organizations. See all the winners, runners up, and discover new, favorite places and restaurants that you may never have heard of, and be sure to check out My Guys on p.25 of the publication’s special section. There is an exciting community event planned for later this year at the Village at Leesburg where, along with other local businesses and organizations, My Guys Moving & Storage will have the opportunity to express our appreciation and gratitude. Look for balloons, cupcakes, and giveaways, and a chance to meet the Guys! The event will be free to the public. For more details, check our Facebook page as we get closer to autumn. Hope to see all you Loudouners there!